We’ve written before about the Emeryville Public Market’s ongoing efforts to reinvent itself into something more destination-worthy and, well, cooler than a standard-order shopping plaza and food court. The latest trend the Public Market is jumping on? The pop-up market. Starting in October, the Public Market has brought in the Sacramento-based event agency Unseen Heroes to curate a series of weekly Thursday night pop-up events known as DISPLAY. Unseen Heroes co-founder Roshaun Davis explained that the basic idea is to take a relatively small space — in this case, the section of the Public Market food court between the ball pit and the rear entrance — and convert it into a sleek pop-up market that can be reconfigured from week to week to serve a variety of purposes. 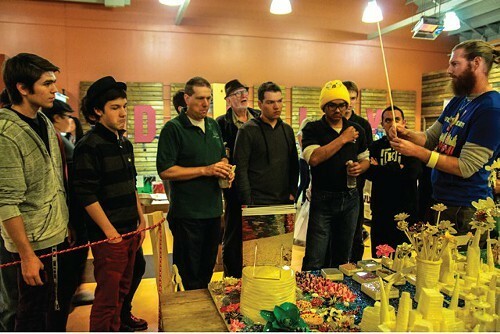 One of the workshops at the launch event for October's design-themed pop-up (via Unseen Heroes). The October pop-up series, which just ended, was focused on design. November’s theme will be food, so for one Thursday evening (November 14), the space will be configured to form several mini classrooms, where, for a small fee, participants will be able to take part in a variety of hands-on workshops — on how to make pizza dough, for instance, or how to make organic juice. On another Thursday (November 21), the pop-up will be set up as an artisan food market, with stalls run by local food vendors as well as those from all over the greater Bay Area. The food-themed DISPLAY pop-up will kick off next Thursday, November 7, from 5 to 9 p.m., with a launch event that will feature a smaller selection of both workshops and food vendors. There will be workshops on holistic nutrition, pie dough-making, and gomasia (a Japanese spice mixture), among others, and the food vendors will include several of the startups based at the incubator kitchen Kitchener Oakland — Stroopie Gourmet, LulaMae Bakes, and Keena’s Kitchen, to name a few. Prospective vendors interested in participating in the food market or in December’s holiday-themed pop-up series can apply via the DISPLAY website.